Mirfield Parish Cavaliers maintained their hopes of promotion in the Drakes Huddersfield League Championship thanks to a 102-run win over Almondbury Wesleyans last Saturday. With two games remaining, Parish are two points behind joint leaders Shelley and Rastrick ahead of Saturday’s final home game against second-bottom Linthwaite. Captain Tim Orrell led the Parish innings with 63 and shared a healthy opening wicket partnership with Rashid Yousaf (50). Daniel Broadbent chipped in with 48, while Ben Tillotson boosted their total to 237-9 as he made 27 not out late on. Ben Shufflebotham was pick of the Almondbury bowlers with 3-45, while Ashley Smith claimed 3-80. Jacob Gibson (31) and Thomas Jackson (26) led the Wesleyans reply but they were bowled out for 135 in the 35th over as Daniel Hope (3-29), Tom Fretwell (3-35), Nazar Hussain (2-32) and Connor Rowlands (2-35) combined to ensure Parish take the title race into the final two weeks of the season. Shelley moved level at the top after they won their top of the table clash with Rastrick by four wickets. 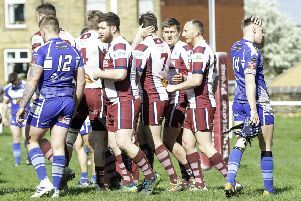 Parish will look to win their final two games in a bid to claim a place in the Premiership and following the visit of Linthwaite, they end the season with a trip to fourth-bottom Lascelles Hall on September 9. Moorlands suffered a five-run defeat away to Golcar and now bid to keep hold of fourth spot in their remaining three games. Golcar posted 193 all out as Upul Bandara struck a half century, while the home side’s total was boosted by an impressive ninth wicket partnership between number nine Craig Horner (38) and number 10 William Hinchliffe (35). Nicky Smith claimed 6-44 before the Golcar total was boosted late on. David Winn made 53 at the top of the Moorlands reply and although their middle order faltered, they fought back with a late order revival. Sam Storr struck 27, while Jared Maxwell (42) and Michael Padgett (23) threatened to win it for Moorlands. As Moorlands edged towards victory, Smith was run out for nought and they finished agonisingly five runs short on 188. Moorlands are four points clear of Broad Oak in fourth spot and they travel to Skelmanthorpe on Saturday and host Cawthorne on Sunday. Mirfield picked up their sixth win of the season to move off the foot of the Conference as they overcame Hall Bower by 53 runs. Shar Khanagha (43) and Tom Edwards (29) were the leading Mirfield run scorers as they were bowled out for 171, with Ibrar Rafiq (4-43) and Faisar Siddiq (4-60) doing most of the damage. Hall Bower were bowled out for 118 in reply as Islam Hussain led the way with 5-31. Emma Bolt opened the bowling and claimed 3-53, while Naseer Saudagar claimed 2-23. Mirfield moved up two places to third bottom and they travel to Thurstonland for their penultimate fixture this Saturday.